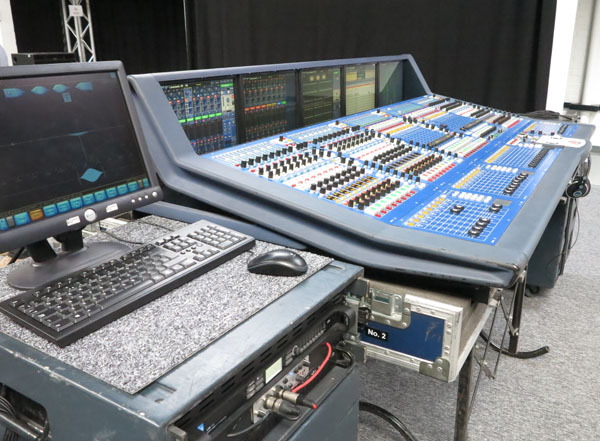 Trouble is, as I was to discover when I spent a day with the experts at Britannia Row Training, almost all our preconceptions about the sound systems we experience at live events – and the people who set them up and ‘drive’ them – are somewhat wide of the mark. The modern PA system is a long way from those set-ups used when music first moved from small venues into huge arenas and open-air locations, and the knowledge needed to get the most out of it is such that, while the odd decade or four of experience helps, the people at Brit Row find most of those coming out of academic institutions with what look like relevant qualifications really haven’t got a clue. That’s where the Britannia Row Training facility, tucked away beside a railway line in South West London, comes in. 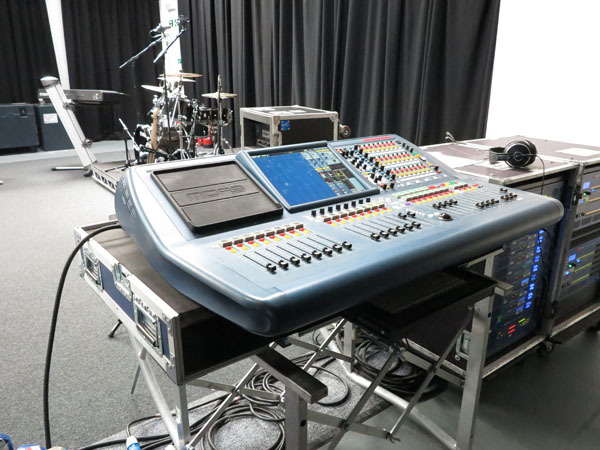 The company may be one of the biggest players in sound reinforcement equipment supply and rental, but it has a relatively small permanent staff of around 35, plus a retinue of some 100 freelancers who install and operate its systems worldwide. The training scheme is all about ensuring more well-qualified people keep joining the industry. Spend time with the trainers and you start to hear a whole range of road stories of varying repeatability, but then the experience here goes back to the early days of the company, and systems for the likes of The Who and Pink Floyd – the latter being responsible for setting up Britannia Row in the first place. More on the history in a moment, but the purpose of the training facility is to take small groups of students and put them through intensive courses designed to address what’s seen as a skills gap in the live sound industry: many of those who’ve grown up in the world of PA systems are – to be frank, and by their own admission – knocking on a bit, and there’s a need to bring on new talent to replace them while learning from their experience. 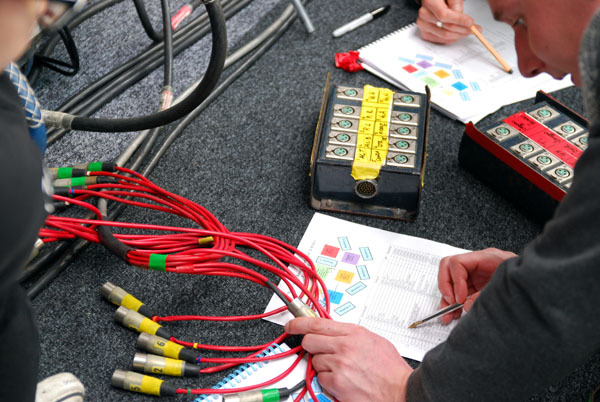 To fill this need, Britannia Row Training offers a range of courses, the core one being a twelve-week, full-time curriculum: the Live Sound Technology Course, covering everything from the basics of electricity and health and safety to the design, optimisation and operation of systems. With a dozen or more students, each paying around £6000, the course makes use of the facilities of the training centre, which is set up with a full concert rig in miniature, complete with stage, monitoring and front of house equipment, and also takes in practical ‘band days’, gig visits and mentoring by professionals, both sound engineers and audio technicians, working at the top levels in the industry. And of course with Britannia Row’s massive inventory of state of the art equipment, students get to experience a full range of hardware and software, preparing them to work just about anything they may come across in their professional lives. That’s part of the appeal of the course: not only are the tutors working professionals, with masses of experience, but for example the digital console on which the students learn their skills may have just come back in from a major event. It’s all real-world stuff, not textbook learning. So, Britannia Row Productions, then: so-called because it was founded in 1975 at 35, Britannia Row, Islington, North London, by Pink Floyd. Having been on the road more or less continually since the 60s, the band shifted more towards studio working, and needed a base for the sound and lighting equipment it had accumulated over all those years of ever-larger tours, along with the technical crew it had assembled to operate it all. It was part of a trend several of these mega-bands followed at the time: The Who established a similar base at Shepperton Studios, west of London, Jethro Tull came to rest in Acton, West London, and Emerson, Lake and Palmer memorably bought an abandoned Odeon cinema in London’s Fulham Road to store their equipment – at the time they were trucking around 36 tons of kit between shows, including a quadrophonic PA system and of course Emerson’s flying piano – and act as a rehearsal/recording venue, Manticore Studios. 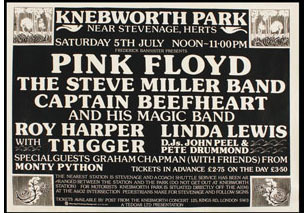 Thus Britannia Row Productions was established to hire out Pink Floyd’s equipment when the band was off the road, although the company’s first concert was Pink Floyd at Knebworth on July 5th, 1975, in front of some 100,000 people. Britannia Row started out big, rather than growing from a ‘man and van’ operation as others had: it provided the systems for celebrated events such as Queen’s free performance in Hyde Park in 1976, which drew some 150,000 fans, and ‘The Picnic at Blackbushe Aerodrome’ two years later, headlined by Bob Dylan supported by Eric Clapton, Joan Armatrading and Graham Parker and the Rumour. It had all come a long way from early PA systems using the likes of the WEM Audiomaster mixer, which offered just five inputs and one output – though you could daisychain them to give nine inputs into that one output! – and the column speakers used for vocals. 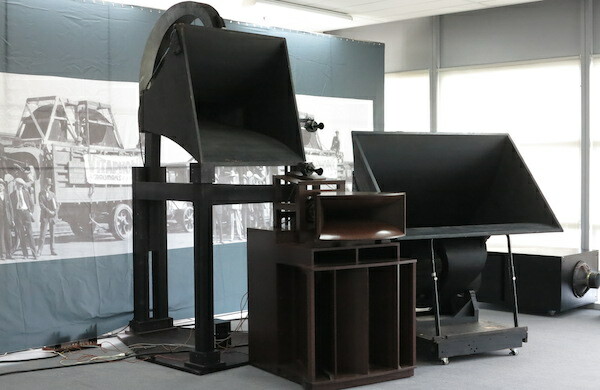 As venues got bigger, there was a demand for larger systems, so PA companies had turned to the ideas used in the cinemas of the 1930s, with horn-loaded speakers such as the Altec Voice of the Theater and the other designs preserved, restored and still played to much acclaim by Silbatone at the annual High End Show in Munich. More power – is 523kW enough? 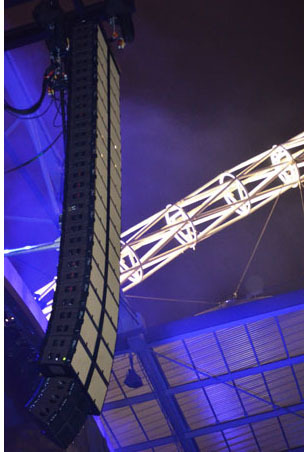 However, ever more powerful amplifiers were used as bands wanted the sound ever louder, and eventually PA systems moved on from the stacks either side of the stage to ‘flown’ arrays, suspended high above the stage and audience – but not before Iron Maiden set the record at Castle Donington in 1988 for the world’s largest PA system. Five days, as Britannia Row director Mike Lowe recalls, because the set-up was a three-tier one, and curved, so once the first ‘layer’ was in place, every speaker in the following two rows had to be measured and place precisely. By this stage, the old ‘bin and horn’ systems – bins for bass, horns for everything above – were being replaced by composite full-range enclosures: thanks to their regular shape they were easier to transport and could also be ‘flown’ more easily, as well as offering a ‘point source’. Also by now Britannia Row Productions was no longer owned by Pink Floyd, but a separate company in its own right, following a management buy-out in 1984. Since then it has moved from Islington to Wandsworth, where the training centre is now located, and most recently into new premises in Twickenham, South West London, and worked with a huge roster of bands and artists. 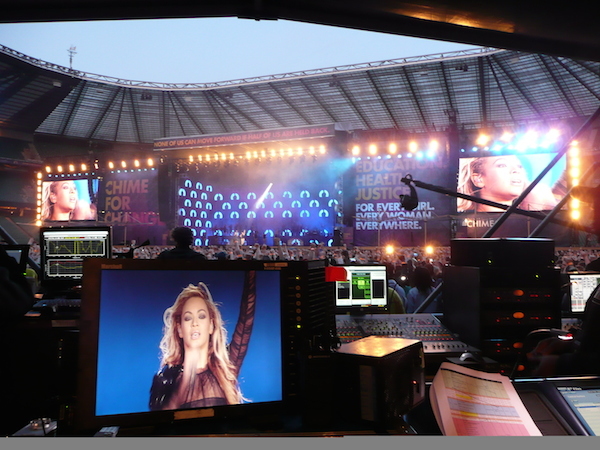 It provided sound for the likes of Roger Waters’ The Wall concert in Berlin in 1990, the opening and closing ceremonies for the 1992 Barcelona Olympics and London 2012, the Millennium celebrations in London, Live 8, and the 2010 World Cup in South Africa, not to mention record-setting events with Oasis in 1996 and Robbie Williams in 2003, both at Knebworth. Live events are back, not least because the Internet has reduced the income bands can achieve from recording, so they have to get back out on the road and earn some money. Hence the demand for companies such as Britannia Row – and for trained people to operate the live sound systems. Lowe explains that an arena PA system costs around £1.5m, and rents for more than £30,000 a night, so it’s vital the equipment used not only sounds good, but is rugged enough to withstand life on the road, light enough for ever larger rigs to be flown in venues, and easy to maintain. But above all, the company needs reliability – ‘We work live. Failure is not an option’. That’s something about which graduates of the Live Sound Technology Course become fully aware: as well as the technical and practical knowledge they will gain, they’ll also acquire the people skills needed to deal with performers and others, and the ‘can do’ attitude running through everything the company does. 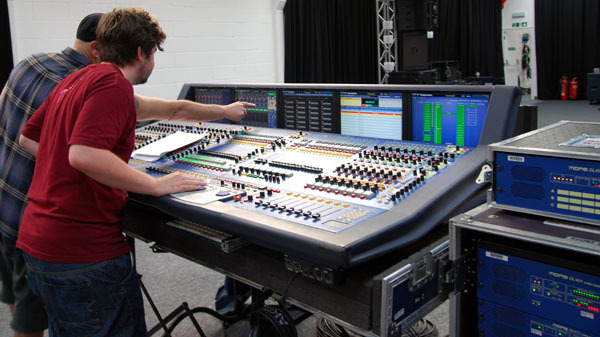 Mathias Postel, the MD of Brit Row Training, explains that working in live sound isn’t just about ‘driving the desk’, although to the public the Front of House engineer’s is the most visible role. Making sure the system sounds good in the venue is the system engineer, who actually sets up the amplification and speakers, optimising it for ‘the room’ and the position of the speakers within it to deliver as accurate a sound as possible. Oh, and compensating for how the sound changes between an empty hall and a packed one, and alters as the temperature and humidity rises during the course of an event. 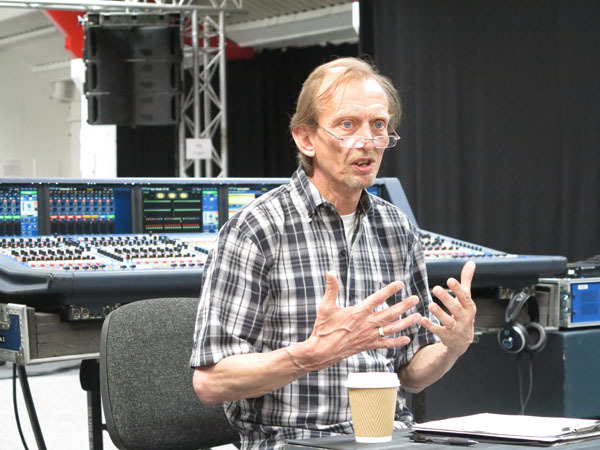 And as Course Director Barry Bartlett (above), a 37-year veteran of sound design and mixing, explains, this way of working has changed the way sound systems are operated, to the extent that one can take the main mixing console settings from one venue to another, maybe on opposite sides of the world, and – provided the amplification, equalisation and speakers are set up properly – it should sound exactly the same. He points out that’s one reason why ‘off the desk’ live broadcasts and recordings sound so much better these days: whereas once the FoH engineer was trying to use the console to compensate for deficiencies in the speaker set-up or the venue acoustics, now it’s all about getting the cleanest sound from the console to feed into the equalisation, amplification and speakers. In other words, the mix engineer works for the best sound, while the system engineer aims to deliver that sound as well as possible to the entire audience. Bartlett, who one can safely say has worked with the greats, started out as a guitarist in South London, when he was in an early version of Squeeze with Chris Difford, moving into sound when he realised his rather more talented band-mates were going off and forming bands of their own, and working with local bands such as The Fabulous Poodles and Dire Straits. He says he’s been ‘playing with the big hi-fi’ for more than 30 years, but in fact his interest goes back even further: his father was a tape-recorder enthusiast, and the young Bartlett spend his Saturdays in Tottenham Court Road keeping up with the latest technology. Since then he has worked in senior engineering roles with most of the major British rental companies, has worked across rock, classical and contemporary music as well as musical theatre and corporate events, and designed and mixed the sound for Damon Albarn’s opera Monkey – Journey to the West in Manchester, Charleston USA and London in 2007-9, as well for a new production for the Lincoln Center Festival in New York last year. He also engineered a 2012 Israeli Opera production of Bizet’s Carmen – open air, huge outdoor set, cast of 200 plus orchestra and animals, in the South Judean Desert. So ‘playing with the big hi-fi’ is one way of putting it, but the kind of systems Britannia Row operate are rather more sophisticated than those we have at home. For a start, they’re running a lot more channels, both on the inputs and on the outputs: the systems now used are fully active, using digital signal processing and digital amplification so that basically every drive unit can be controlled and adjusted if required. These days the inputs and outputs on the console are more likely to be digital, with the AES50 (or SuperMAC) standard handling up to 24 bidirectional channels at 96kHz or twice as many at 48kHz over CAT5/5e runs of up to 100m. If that’s not enough, the HyperMAC standard can handle 192 bidirectional channels at 96kHz, or again twice as many at 48kHz, over the same runs of copper cable, or up to 500m over optical fibre. However, there’s always a copper cable back-up, just in case of catastrophic or just intermittent digital failure. Bartlett and Luca Stefani (above right), who worked with him on Monkey, demonstrated some of the ways systems can be planned, based on data provided by the equipment manufacturers, even when it’s not possible to get into the theatre until just before the show is due to go up. In fact Bartlett had only been to Lincoln Center once before Monkey was due to move in – and that had been to a gig some 30 years before. Oh, and he was also in the process of setting up the Brit Row training facility, which opened about the same time as the Monkey revival, so it was down to Stefani to do most of the move in to the venue, leaving Bartlett to fly out, check all was well, and press the ‘go’ button. 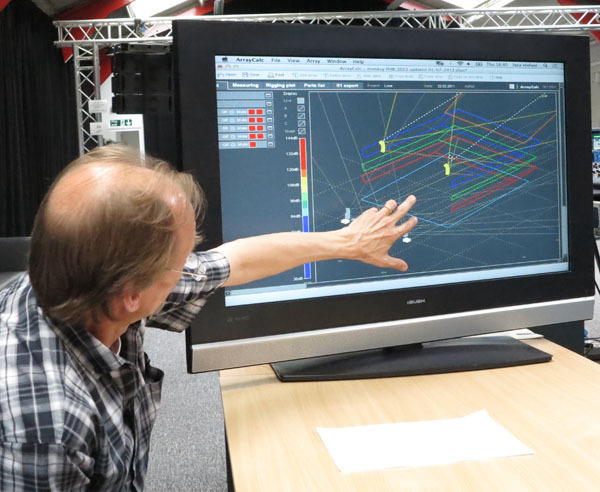 Using internet research and the diagrams already created to show the positioning of scenery and lights, the two were able to employ their computer modelling software to determine what equipment would be needed, and where it could be positioned to give the best possible sound for the entire theatre. Bartlett’s philosophy of good live sound is sonic integrity plus sonic equality: in other words, what you hear should be as close as possible to the sound of the instruments or voices, wherever you are in a venue. Those factors are determined by the quality of initial capture (the choice of microphones and their placement); the quality of the signal processing (the quality of the DSP, and how appropriately is it being used); and the quality of the speakers, their design and positioning. That idea of ‘sonic integrity’ informs the near-universal use of line-array speakers, effectively using bass units straddling mid/treble drivers, and flown in vertical stacks – those familiar J-shaped rigs – to give precisely aimed sound. The speakers within these arrays have a narrow vertical dispersion pattern, enabling them to cover areas with seating at a range of levels with minimal overlap between elements. They’re also fast and easy to rig, just linking together with built-in fittings as they are winched up into position. 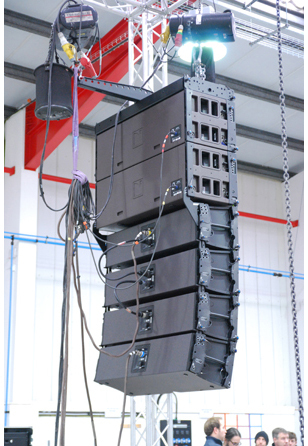 Underpinning these speakers are subwoofers, but Bartlett points out these aren’t set up for left and right channels, but used in arrays, positioned to millimetre accuracy as guided by the sonic prediction and optimisation software. The use of digital mixing equipment also has benefits beyond not having to cart consoles and other equipment around so much – the settings for a show can be copied onto a USB stick, and when this is plugged into a similar console wherever it may be, those settings are instantly ready to go – : in the old days of multi-artist events such as the big charity shows, every band or performer would have their own mix set up on their own console, and these would have to be swapped between sets. Now, all the band’s engineer needs bring is that USB stick! Oh, and as an aside, where do you think the majority of sound engineers in the USA work? In houses of worship, which increasingly have music as part of their events. Bartlett says there are more sound engineers in the States working in churches and the like than there are in the touring industry, and Mike Lowe chips in that one of the consoles like that used in the training facility will cost maybe £125k, and will have an initial production run of 100 units a year, of which 90% will go into houses of worship. They have to have the latest equipment, you see. I can only say that the small groups of students who make it onto the training courses will not only definitely get their money’s worth, but will be inspired and entertained in equal measure. I’m just a little bit jealous of them – oh, alright then, a lot jealous – and can’t help thinking how fascinated many audio enthusiasts would be to have a potted version of the training, just so the next time they went to a gig they’d be even more aware of the technology and expertise being used to deliver the sound. Next time I go to a big event, I’m going to be watching and listening even more closely. For more details of the courses offered, see the Britannia Row Productions Training website. Very interesting, thank you. I too would love to try something like this but am now far too ancient! With regret, that’s exactly the conclusion I came to, too! Interesting article Andrew, the first of yours i have read since leaving D&M and starting my own audiovisual company http://www.equipeaudiovisual.com Glad to see you have other interests of audio too! I now play with my big hifi’s every day and get to push my interests an influences as an audiophile to the masses LOL! Many thanks – great article! Hi Andrew i found this a very interesting and eye-opening read. I am a studying Sound Design Student and am currently researching for primary and secondary for my dissertation. I was wondering if would be able to offer any help with regards to information or any experience you have had.